Above : A choice poster from the Carlton Gardens. The Melton-based grouplet True Blue Crew (TBC) organised an ‘Australian Pride’ rally in Melbourne today; the Campaign Against Racism & Fascism in conjunction with No Room For Racism organised a counter-rally to oppose it. About 100 or so fascists (possibly fewer, and mostly familiar faces), assembled in Carlton Gardens at approximately 11am, near the corner of Victoria & Rathdowne streets, as did a larger counter-protest nearby (and closer to the intersection). Several hundred police were also present, separating the two groups and otherwise maintaining a presence in the Gardens. After half-an hour or so of milling about and shouting, the fascists made their way to the Gardens near the corner of Victoria & Nicholson streets. With several hundred police reinforcements, they then marched up Nicholson onto Spring street before assembling in front of the Parliament — the counter-rally tried to follow but was blocked by police and forced to approach Parliament up Bourke street, before again being blocked by a police line at the corner of Bourke & Spring streets. For maybe 30 minutes or so the fascists chanted, sang an awful rendition of the STRAYAN anthem (stopping after the first verse — lol), while also being treated to some speechifying by United Patriots Front (UPF) fuehrer Blair ‘A picture of Adolf Hitler in every Australian classroom!’ Cottrell and his sidekick, Li’l Tommy Sewell. (On a brighter note, the patriotik dregs were also treated to ‘77%’ by The Herd, which was blasting from the counter-rally.) The fascists were then marched by police back the way they came, up Nicholson street and to the Gardens, at which point they dispersed. The counter-rally was blocked by police from returning to the Gardens and at some point police used pepper spray (near the corner of Russell & Lonsdale streets), which affected maybe 10 or more individuals. Spotted at the fascist rally were members of TBC and UPF, obviously, Soldiers of Odin, and a handful of members of neo-Nazi grouplet Right Wing Resistance Australia. (Most who sported merch were wearing TBC gear, although a handful had UPF.) Notable for their absence was the Kekistani Army, with just one yoof sporting the flag. Finally, rather than retire to The Pumphouse as on previous occasions, a small group of fascists was escorted by police to Fed Square, where they were welcomed by Transport Bar. Congratulations to police (I guess) on facilitating a fascist rally and march through Melbourne (and for pepper-spraying opponents — for medical advice, please see Black Cross Resilience); the size of the fascist crowd was approximately the same as it was 12 months ago, if not slightly smaller, with those present forming the core of extreme-right opinion in Melbourne. They were vocal, and cobbled together from every tinpot group in town and from further afield (principally Bendigo). Despite some frothing-at-the-mouth commentary by some TBC loons, there were no clashes between the two sides as far as I’m aware, with police being delegated the task of protecting the rally and march — which, with overwhelming force, they achieved. Finally, any possibility of halting a fascist march in future will likely depend on there being (many) more counter-protesters — a possibility, but one requiring a good deal of work. In any case, mAd props to every one who came out today to oppose the flagwits! See also : Knife, knuckleduster confiscated as right-wing, anti-racism protesters clash in city, Alexandra Laskie, The Age, June 25, 2017 | ‘Australian Pride’ protesters face anti-racism protesters in Melbourne, SBS (AAP), June 25, 2017. Note that police had declared the CBD a designated area between the hours of 8am and 8pm today, giving them carte blanche to conduct searches. 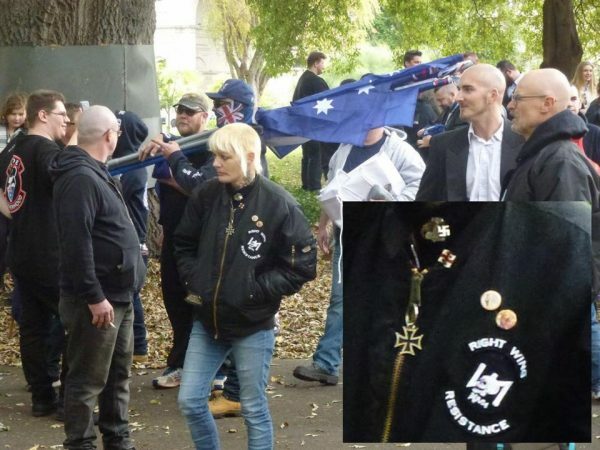 Above : As noted, a handful of members of neo-Nazi groupuscule ‘Right Wing Resistance Australia’ were present. From L to R : Cleve Pepprell (? ); ‘Sammy Chelsea’; James Lawrence; unknown. Note that one member of RWRAU, Ricky White, was arrested in September last year and charged with the arson of a church in Taree: I’ve no idea what’s become of his case. Finally, note that most neo-Nazis have too many smarts to wear their swastikas in public and for today’s performance the Nazi flag was replaced by the Australian. NB. NO BEER FOR YOU! At around 3.30–4pm today, a small group of TBC gronks, including their lvl boss Kane Miller, attended The Curtin Hotel opposite Victorian Trades Hall Council. Upon entering the premises they proceeded to the bar, but were denied service, and left. As they did so the boys shouted something about ‘slanty-eyed c*nts’, and otherwise entertained pub-goers and passersby with abuse (‘f*cking dirty lefties’ etc., etc., etc.). Props to the staff at The Curtin for showing the boys the door. Otherwise, while they remain a very small group of racist meatheads, the fact that the TBC receives the nurturance and support of VicPol means incidents like this will become more likely … and the situation end in tears. This entry was posted in Anti-fascism, Media, State / Politics, That's Capitalism! 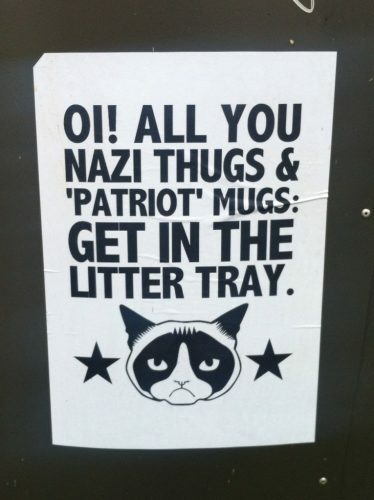 and tagged antifa, Blair Cottrell, Campaign Against Racism and Fascism, Cleve Pepprell, James Lawrence, KEK, Right Wing Resistance, Right Wing Resistance Australia, Sammy Chelsea, Soldiers Of Odin, Thomas Sewell, Transport Bar, True Blue Crew, United Patriots Front. Bookmark the permalink. It is pretty sad that TBC looks more civilised than blackclockers. You should reassess your subjective reality urgently. as a first timer reading your blog, i’m not quite sure what you refer to as a flagwit but it seems you’re one of those antifa types. which is fine i guess you’re entitled to dislike fascists as is the next person but after reading a few of your articles I’ve come to the conclusion you’re not really an anarchist are you? you’re more inclined to replace one political agenda with your own rather than abolish the government altogether. Essentially you’re all talk, probably don’t even show up at these rallies yourself just gather media from various sources and upload it to your blog and write about it. I don’t mean to criticise so bluntly, I just think talking about change is pointless if you’re not actively trying to force it you know? I’ve read a few blogs over the past few weeks looking for individual activity but everyone seems to be into the mass protest ‘black bloc’ type of rally. gone are the days of radicalism i suppose where political activists actually put up a fight for what they believe in; these days are all about propaganda and peace rallies right? modern hippies. lol. As long as you remain anonymous you’re happy to voice your opinion but if people find out who you are you’re not so loud right? I understand, i’m not so different, though I tend to keep my opinions to myself (mostly). I’m more the nihilist anarchist i think; reject everything and hope for the best you know. Anyway just wanted to protest against your pointless writing, this is me being you and your peaceful black blocs of anonymity lol. After reading a few articles all I’ve noticed is how opinionated you are and how you talk down to people that disagree with you. It’s somewhat amusing to be honest. I’ve quite enjoyed the read I suppose that’s really what a blog is for though isn’t it? nobody important reads them; it’s just for entertainment purposes, right? in that case, job well done sir!